In our previous post, we took the time to highlight the range of plumbing and HVAC services we offer here at Bears Family Plumbing, Heating, And Cooling. The three primary service categories we have are general plumbing repair and service, residential plumbing, and HVAC repair and installation. We also gave a few of the more common examples as to what this might look like for folks looking for HVAC or plumbing service. While we won’t be going through the exhaustive list in today’s post, suffice it to say that if you have issues like a leaky faucet, have a broken air conditioner unit, or are in need of water heater repair, a bath remodel, furnace repair, or some other plumbing or home heating service, give us a call. If you are in Loveland, Fort Collins, Denver, or somewhere else along the Northern Colorado Front Range, reach out to us today to get your plumbing or air problem fixed affordably and promptly! With over 15 years of providing plumbing repair, we are a Loveland plumbing company that cares about our reputation in the community to which we belong. As is the case with any business, we need to be profitable to survive. But we do this not by looking to make a quick buck by charging locals in desperate need of a Loveland plumber rates that aren’t fair; we do it by delivering exceptional work on every project, big or small, always with a fair price point. That is how we’ve remained in business for 15 odd years and it’s how we plan on being around Fort Collins, Denver, and Loveland for a very long time to come. In today’s post, we’ll be focusing on what other people are saying about our local plumbing company. Although we believe tooting our own horn, as it were, is an important part of marketing ourselves, perhaps an even more significant factor in relaying our value is our prospective clients hearing about our quality of work from folks who have experienced Bears Family PHC first hand. If you are interested in reading first-hand reviews and testimonials about us at Bears Family Plumbing, keep reading, because this one is for you! Before we get too far into today’s post, allow us to explain why reviews matter to us, so much so that we are dedicating a blog post to the topic. Quite simply, reviews are our lifeblood. In today’s world, word-of-mouth reputation still matters (you might ask your coworker who their dentist is and if they like them), there is nothing that compares to the quantification of review information that can be found on popular online review sites like Google Reviews, Yelp, and the like. When you find Loveland or Fort Collins plumbers who have a stellar online reputation, it’s a good sign that they do excellent work. This isn’t rocket science here. But what we would like to point out is that it is somewhat remarkable to find any kind company with overwhelmingly positive reviews when one considers the fact that it makes much more sense for someone who is displeased with the service received to leave a negative review than vice versa. Psychologically speaking, if you pay your hard-earned money for any kind of product or service, you expect to get good value for your money. If your standards are not met, that is when most people take time out of their busy days to let other people know not to repeat the same mistake they have just made. Conversely, when someone receives a service or product that exceeds expectations to the point where folks feel compelled to share their great experience, it’s a good sign that company is doing something right. We have a Google Reviews rating of 4.9 stars here at Bears Family PHC, and today we will be highlighting a few of our favorite pieces of customer-provided feedback! We say that we want our first-time customers to become lifelong clients. And while that sounds catchy, it’s more than just a catchphrase, as evidenced by Allie’s five-star review seen above. We wanted to highlight this review because it not only shows a happy customer, it exemplifies our commitment to showing up as soon as we can all while doing a professional job. Thanks for taking the time, Allie! Loni, thanks for the very thorough five-star review! We understand that needing water heater repair or even a water heater installation can really set you back financially, so it’s important to behave like Loni did and get a few estimates. We are confident that when you put our estimates to the test, they’ll stand up to the competition as affordable. When you can couple that with reliable workmanship and a dedication to customer satisfaction, you have a winning formula! Thanks again, Lori! We are an affordable local plumbing and HVAC company, as Rachel has attested. We take great pride in our work, yes, but also our commitment to not charging an “arm and a leg” as Rachel put it so well. Thanks for your kind words and business, Rachel! Getting reviews like this makes it a little easier to get up at the crack of dawn; it makes us proud to do what we do. Most people don’t think about finding a local plumber until they need emergency plumbing services. But when you do need us, we are ever-available with a commitment to getting to your home as soon as we possibly can. In William’s case, it was on a weekend and he did need an emergency plumber. William points out a policy our customers love; we won’t charge you for the arrival fee if we do the plumbing repair work. It’s just another way we work to make sure you choosing Bears Family PHC is a win-win for both us and the customer! Thanks again, William, for your business and five-star review! 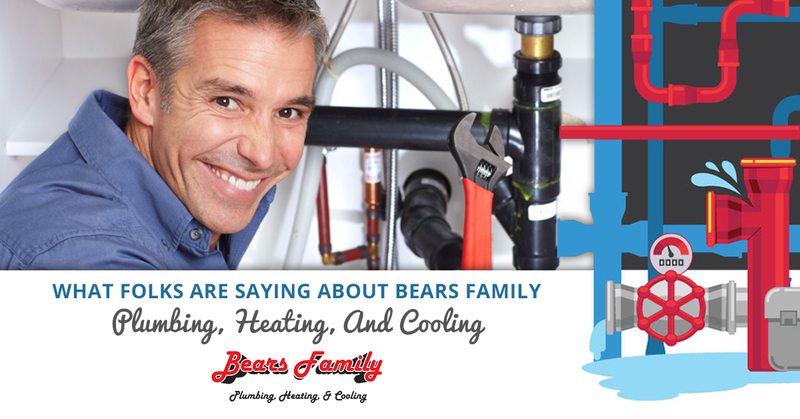 Give Bears Family Plumbing, Heating, And Cooling A Call! If you are in need of a furnace repair or a plumber to fix some leaky pipes, give us a call today. Whether you are in Fort Collins, Loveland, Denver, or elsewhere along the Front Range, get in touch with us today!